Six Strand CD-ROMs which include a wealth of ideas for whole class starter and lesson activities, all linked to the National Numeracy Strategy Framework objectives. * Each CD-ROM ensures continuity, progression and differentiation across Years 3–6. Teacher's Notes are available to accompany each Strand. Mult-e-Maths Toolbox is a versatile resource where you can plan, create and save your own activities. Use it to create your own lessons or develop extension or support activities alongside the Strands. A Maths Dictionary for Kids provides a clear explanation of the meaning of each word, plus animated illustrations and examples. Use it for revision or when introducing new vocabulary. 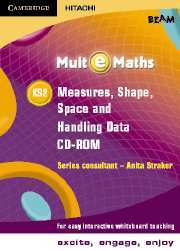 * From 2007, Mult-e-Maths New Framework EditionTeaching CD-ROMs 3–6 will replace the six Strand CD-ROMs, fully revised and refreshed to match the renewed Primary Framework for Mathematics. Mult-e-Maths Planning CD-ROM New Framework Edition adds Mult-e-Maths activities to the structure suggested by the Primary Strategy, helping schools implement the renewed Framework by choosing sections to adapt and embed.